The frequency of macroeconomic releases will pick up this week. Reports for first-quarter GDP data are in the pipeline, with China in the lead. The verbal give-and-take between the United States and Russia continues and the U.S.-China trade war could also affect investors sentiment. The Hungarian scene, however, will be serene, with no meaningful release scheduled for this week. The week will start slow. As regards international markets, the only set of data we should keep an eye on on Monday is retail sales figures in the U.S., while the Hungarian market leaves us with even less to look for. Tuesday will not be the most exciting day ever in Hungary. Only the Government Debt Management Agency’s (ÁKK) weekly auction is worth mentioning. However, China is to release its Q1 GDP data at dawn, opening the series of such releases for the following weeks. Experts believe economic activity was similar to that in the fourth quarter of last year and that growth grew close to 6.8% recorded in Q417. Germany’s ZEW index will also be published on Tuesday, along with the latest industrial production data in the United States. 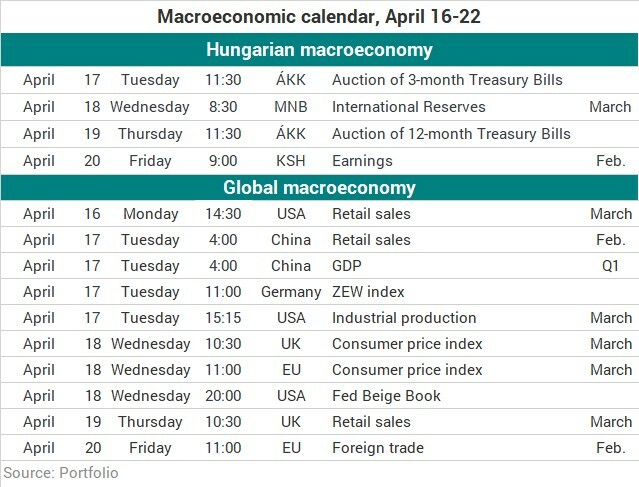 On Wednesday morning, Hungary’s central bank (MNB) is to release its statistics on international reserves for March, but this is unlikely to be a market mover. Inflation figures are to be published in the United Kingdom and the European Union, and some of the investors will keep an eye on the Federal Reserve’s Beige Book in the evening. No meaningful release is in the pipeline for Thursday either. The ÁKK will hold its biweekly auction of 12-month discount Treasury Bills and it will also offer floating-rate bonds for sale. Retail sales stats are due out in Britain. On Friday, the Central Statistical Office (KSH) is to publish its wage statistics for February, which is unlikely to affect markets much. Wages in the business sector grew by 13.2%year on year in January, which is a lovely figure, considering that many expected less sharp increase than in the base period. Now we’ll know if the growth rate was maintained in February or not. Eurostat, the statistical office of the EU, will publish foreign trade data for February also on Friday.